If you were on Facebook yesterday you probably read about the OUCH heard 'round the blogosphere. Glogirly was slicing a loaf of french bread and missed. After the HBO words subsided, she ran off to urgent care with a hand shoved in a roll of paper towels. Some have asked if WAFFLES was at fault. Well I'm sure we can find a way to blame him for something, but truth be told both Waffles and I were upstairs sleeping just prior to the bread incident. No, we were not sleeping together. Well...sort of. But I didn't like it. She's crabby, can barely type and is resting as comfortably as Advil will allow. She says it's nothing serious, just 5 stitches and a big bandage. Thank COD it's not her food hand. Let's help one of the little guys making a BIG difference in the lives of homeless cats. 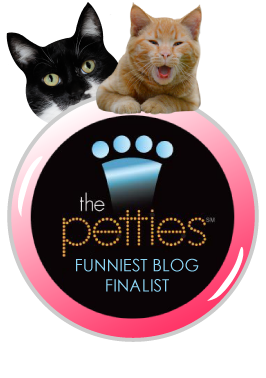 Please vote GLOGIRLY for Funniest Blog. And while you're at it, we've got a number of friends and fellow bloggers that are finalists in other categories. Each of them has selected an equally deserving shelter for their donations, should they win. You have the cutest little nurses in the world! Get some rest and take care!!! Ugh! I missed it, but wasn't on much during the day. Stupid work. Feel better soon! Pee. Ess. If Waffles needs a sitter while you heal, I'm the kitteh for the job! FIVE stitches? Holy Carpe Diem Woman! Hope yer on the mend soon. Waffles looks quite distressed. Ouch! I'm so sorry - hope it heals quickly! This is exactly why we don't have any sharp knives in our house!! Ouch. When the Woman tried to slice off the tip of her finger, she was too busy dancing around the kitchen with said finger in her mouth to make much noise and say any words. I think she was trying self cannibalism but the dog she had at the time went and got her then husband (who is not the Male) who insisted upon doctoring her... Sigh. Poor Glogirly! Slicing bread is the cause of more knife accidents. It's true! I hope she feels better soon. Wow! My human and I TOTALLY missed this! I hope it really is as "nothing serious" as she says. And yeah, GOOD thing it is not her food hand - that would be even more awful! Ouchie!!! Our Mommy recently cut her finger, and she didn't go get stitches even though she was supposed to! She has a funny looking finger now! Oh no! So glad it's not serious, though. We're voting and have your girl take it easy! Would love to have heard those HBO words. Good job you were both asleep at the time!! We're thankful Glogirly is on the mend. You will take great care of her, Nurse Katie. Can you help her type?!? Ouch! We're glad to hear that it's not her food hand, too, and we hope that she mends up quickly. We see that Waffles is already quality-checking the wrap on her wound. Great nursing job! That looks nasty, Glogirly. Hope you heal fast. At least you have an adorable nursing staff! We hopes Glogirly is better soon. We bet she was THINKING of Waffles and that is why she sliced her hand. See we knew it was Waffles' fault. My Mom is always doing stuff like that, we cringe when she sharpens a knife as we envision the upcoming bloody mess. I'm sure it will heal fast and you will be back to normal soon. This is NOT GOOD! Maybe it was good it was a brad knife, not a chef's knife, but those bread knives are serrated ....... ouch. 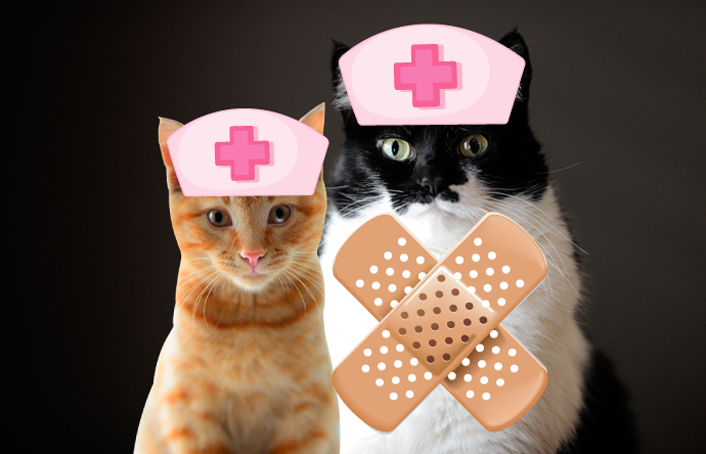 You kitties be good nurses and give GG some nosetappies for us. Oh my dog! Was Glogirly slicing the bread with a chain saw! That bandage looks huge!!!! Hope she feels better soon! OUCH indeed! 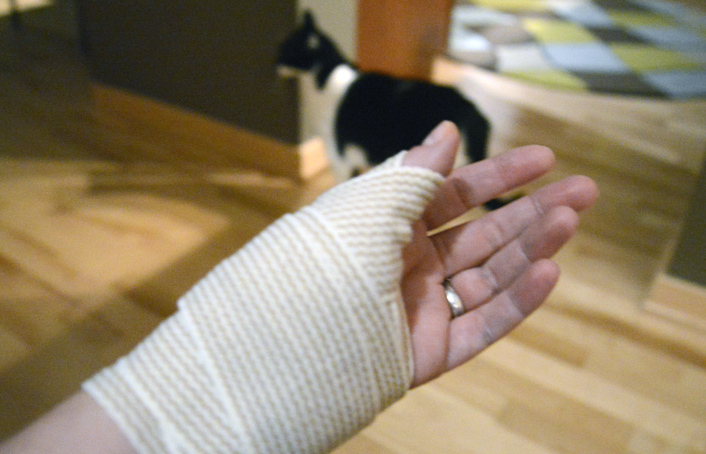 We're glad she didn't lose her finger and are sending purrs for speedy healing. mom flinched when she head the "five stiches" part. ouch.... take good care of glogirly - she is gonna need it. Oh my. I can totally relate, as I have a history of 'kitchen accidents'. So happy you have Katie and Waffles there to assist in your recovery!! hope her hand heals soon. i'm also glad waffles wasn't in the immediate vicinity to pick up any of the hbo words and add them to his vocabulary. I did that to my finger once, I was so greedy I was slicing into a frozen bagel and didn't let it thaw.....3 stitches, NOT NEARLY as bad as Glogirly's!! Hoping she is feeling better soon, that is awful! But....you are right......Thank COD it wasn't the food hand! Oh no! Please feel better and yes, it's a good thing it was not the food hand!!! Ouch!!! Hope you feel better soon. That looks really ouchie. We're very thankful that it wasn't her food hand!!! Thank cod and toona she can still open cans! We hope the hurted paw is feeling better soon! Tsk, tsk, tsk--these Humans just can't be left alone for FIVE FREAKING MINUTES without stabbing themselves or sumfing. Sheesh. Thank Cod she can still open your cans and pet you and give you treats and stuff. We do hope she feels better soon! Oh no! That's one of those moments when you just want to be able to turn the clock back a few seconds. Sending lots of healing energy your way! Oh my! Haven't we all done that a time or two? 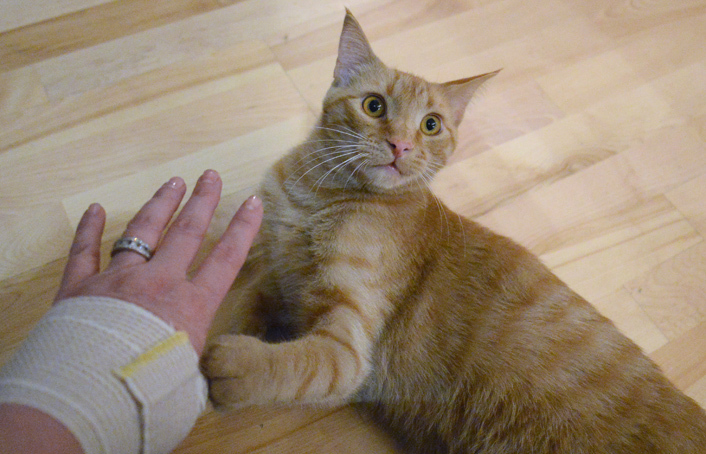 Oh no, we didn't hear and we send healing purrs and (((hugs)) for a swift recovery. Lovely nurses! Heal well, Glogirly! If it was my Mommy I'd be in trouble, cause she's left-handed! Oh owie - M says she nearly sliced the tip of her finger off years ago and it hurt so much and she lost a lot of blood. She didn't go to the urgent care and said after she should have. Now she has a bumpy finger because of the scar. Glogirly was wise to go get care. Hugs for your human. Whew, I'm so happy you two can't be blamed for that one. Oh, yes, good thing it's not her food hand. Hope it heals quickly. We hope Glogirl heals quickly. Gotta have good hand action to open those cans. Ouchie fur sure! Purrs from all of us and we hope the all better shows up really soon! Sending Glogirly lots of Healing purrrrrrrrrrrrrrs. By the way, what happened to the French bread? Purrrrrrrrrrrrrrs. Ouch! I hope it heals quickly. I keep band-aids and gauze in a drawer in my kitchen just for such an emergency. It's been a while since I've cut myself bad enough to need stitches, but those band-aids sure get used up fast! You'd think I'd learn. Sorry GG!! Hope you feel better soon!! Oh no I missed the FB post. Sorry your mom got hurt. Hope her hand heals fast. ouchies! purrrrrrring that Glogirly recovers soonest. Sounds like a good case for pre-sliced bread. Ouch! Five stitches, that is no little cut. Good thing you have a couple of great nurses. It's wonderful to have such cute, sweet nurses. We hope Glogirly feels better soon. Hope you can cute your birthday cake, GG. Or has Gloman banned you from using knivs. We once had someone in the office slice off the top of her finger cutting a bagel. She had to go to hospital. Pop almost sliced the tip of his off on a cat food can but he didn't go to the hospital even though it bleed for hours. Mum sliced her finger about 5 years ago bad. Didn't see her all evening as she had to do the ER thing. The urgent care was closed already. We had no idea! Good thing it wasn't her food-"winning" hand, Orange, or you'd shortly be in some sad shape! Get well soon!